The ProEdge Plus by Robert Sorby is a state-of-the-art system for sharpening edge tools. The Robert Sorby ProEdge Plus system was developed after engineers at Robert Sorby realized that the large machines used in the grinding of new chisels could be reduced in size and made available to smaller shops. The Robert Sorby ProEdge Plus is based on the large linishing machines used in Sheffield to grind new chisels. Made entirely in England, the Robert Sorby ProEdge Plus is a very high quality precision tool. I have spent almost a year working with a protoype system and I could not be more impressed. Unlike other dry grinding machines that we have used, the Robert Sorby ProEdge Plus seems to run very cool, and we have never had any problems with overheating an edge. The only time that I have even noticed a tool getting hot is when I was using a belt that was really worn out and no longer cutting effectively. I tend to do most of my sharpening freehand, and with the precisely adjustable tool rest, the Robert Sorby ProEdge Plus is the best system that I have ever used for free hand grinding. I can take a badly chipped blade on an antique plane and get it to first class condition in no time. The secret is taking maximum advantage of the various belts which are available. Using one of the coarse ceramic belts, you can remove material very quickly, but you will have a very coarse edge. Then switching to a finer belt, you can quickly clean up the edge. Changing belts on the Robert Sorby ProEdge Plus is very quick. I can now do it less than a minute. Click on the images below to watch instructional videos. Pre-set for the most popular bevel angles - 90°, 80°, 60°, 45°, 35°, 30°, 25°, 20° and 15°. The patented angle setter ensures that the same tool rest angle is achieved time after time. The Robert Sorby ProEdge Plus requires no assembly, it can be plugged in and used straight away. Sharpening is carried out by means of a series of quickly switchable belts. Belts run at 1700 fpm, for quick stock removal without overheating. Note: The Robert Sorby ProEdge is manufactured in a Standard and a Deluxe version, however we only offer the Deluxe (Plus) version. for Chisels, Knives, & Plane Irons No image SALE! for HSS Turning Tools, Drills & Router bits No image SALE! for Heavy Material Removal No image SALE! for Extra Fine Finish No image SALE! for Super Fine Surface Finish No image SALE! for Super smooth surface finish & razor sharp cutting edge of 2 microns (equivalent to a disposable razor) No image SALE! Achieving the exact bevel angle on any fingernail or long grind gouge has never been easier than with the Robert Sorby Proset. Place the gouge into the clamp of the profile arm and extend the gouge up-to the required stop and lock it into place. This will allow for precise and repeatable bevel angles to be obtained every time. SALE! PEARBOR Robert Sorby ProEdge Honing Wheel Arbor SALE! PEMOP Robert Sorby ProEdge Buffing Mop SALE! PEPIG Robert Sorby ProEdge Pigtail Mandrel for Buffing Mop SALE! 475 Robert Sorby ProEdge Honing Compound SALE! Hold Cutters for Sorby Multi-Tip Tools SALE! 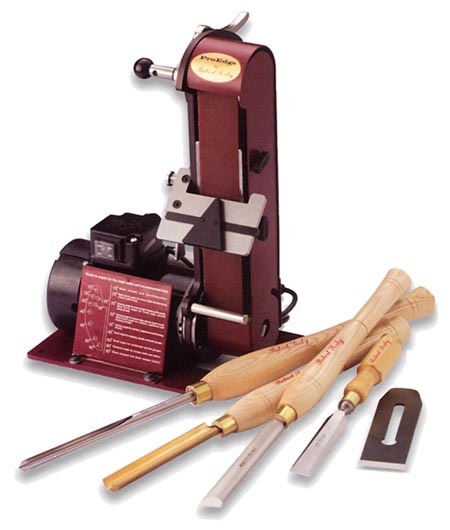 Facilitates sharpening of shorter tools SALE! The Long Grind Jig allows for three different types of profile to be produced on bowl and spindle gouges. It will produce a fingernail profile, a long grind and an extra long grind depending on which location hole the profile arm is placed. It fits onto the bar in replacement of the original fingernail jig that is standard on the ProEdge and is used in exactly the same way but with advantage of three choices. SALE! The side stop is slight adjustable to compensate for blades that are not parallel sided, such as 19th Century plane blades which typically taper slightly in width. SALE! PESQ Robert Sorby Chisel Sharpening Jig SALE! For out cannel gouges with flat fronts SALE! Holds knife blades over 8" SALE!